I just wanted to share with the world how proud I am of all my kids but today especially I am proud of Mia. On January 1, 2011 she made a new years resolution to read the Bible more this year. Today on December 26, 2011 Mia just finished reading The Action Bible. That’s right…. the whole Bible! I don’t know any other 11 year old that has read the whole Bible! So proud of her and all my kids! So earlier today I posted about youtube pronunciation manual and thought it was funny. Tonight the kids and I watched it and they loved it. Thought I’d share this so my family can see it. Here is my first video shot on my iPhone and edited on my iPhone. I’m not real impressed with the youtube conversion. But still blows my mind that I can edit a video on my cell phone! I saw this video for Sienna minivans and loved it. I know this is kind of a stretch to pull something serious out of this but bear with me. Watching this video made me think about how culture portrays peoples life as over when they become parents. However, I gotta say that I LOVE being a parent. Other than submitting my life to Jesus, it’s the best thing I’ve ever done. I like that this family is proud to be cruisin’ in their “SE” instead of an SUV. I like that they are kinda cool and having fun AND parents. I don’t miss my party days one bit. I still party but the safe fun way. 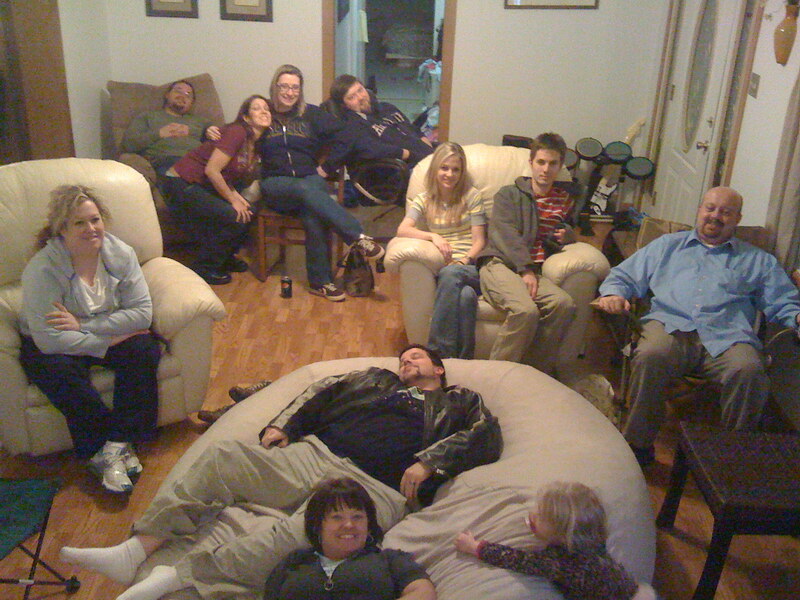 I have a party every week with my LifeGroup friends. Ok – before anyone freaks out – I said family time planning, not family planning. No we are not planning on having more kids. OK. Just wanted to settle that before we got started. So here is where I need your help. I am planning our next family night and am trying to come up with ideas. I thought we should watch Honey I Shrunk The Kids and make it the theme for the night. So I was thinking for dinner we could have Giant Food – but then I thought it would be easier to make “shrunk” food. Since I don’t think I’m gonna find any giant carrots or oatmeal creme pies around. So… lets hear it. Start shouting out some ideas. Give me food ideas, game ideas, prop ideas, whatever. Wednesday night is Lost Night at the Lemons’ household. I love it. Lost is already a kickbutt show, but watching it with my hilarious friends is even better. Can’t tell you how many times we have to stop and rewind because we’re laughing our heads off and missed something! Anyways if you don’t know what I’m talking about when I say business time, then you need to watch this!